The only reason I didn’t give it 5 stars is because there is no way to makes notes (that I’ve found, anyway). I found the annotation, but I like to note if I served it to guests, tweaks I made for our taste, etc. and that’s not quite working for me. I’m still pleased with being able to schlep my recipes along when we travel, just maybe next version, a field for simple notes! This App is so easy to use. I would give it 5 stars if I could create a shopping list on it. How about it developers? Love how easy this is to use. 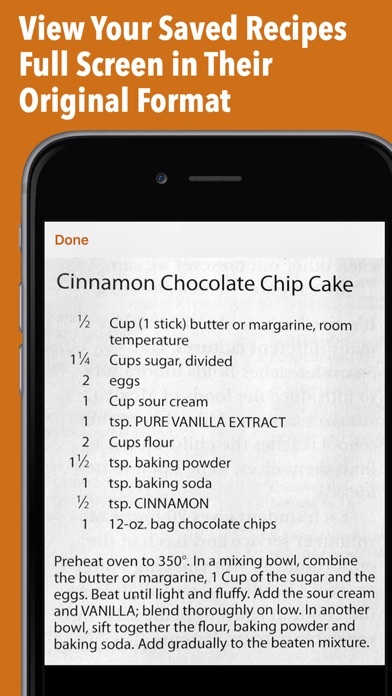 No need to bookmark recipes you find online and sometimes print and lose them. 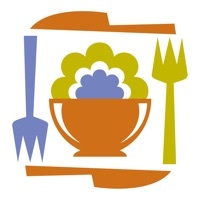 This app allows you to be organized, time efficient and environmentally friendly. This is just the app I have been searching for! I have a stack of recipes that need organizing. So user friendly. Highly recommended! I am obsessed with this app! I have cleaned up piles of newspaper clippings and magazines and added the most delicious recipes that I would have otherwise never tried. Anytime I see a tantalizing recipe on a social media site, I immediately add it to my growing Recipe Gallery collection. 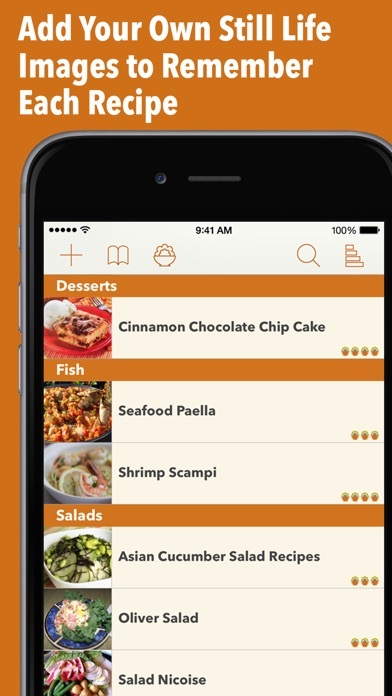 The app is very user friendly and makes it super easy to find anything for a perfect meal. Fun to use - highly recommend! Need to have the ability to share my created recipe library with other members of my family. It would be very time consuming to “share” each individual recipe. If you only “share” the recipe, they also do not get any additions or alterations to the recipe. Also, I was disappointed to learn that the iPad app would require an additional purchase and I would have to sync the iPad with my iCloud account in order for the recipes to “sync”. 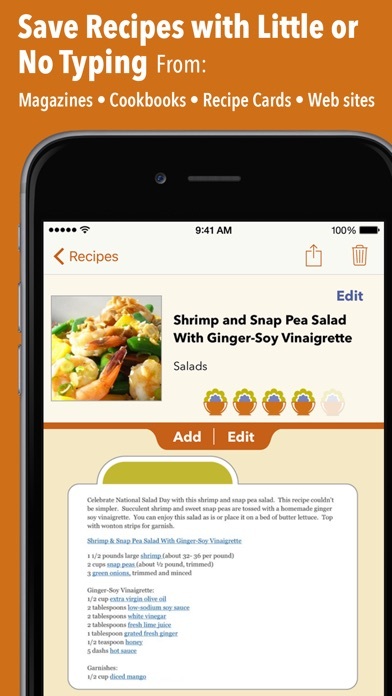 Need to be able to create an account for the app that can then be used to sync with my iPad and/or share with others that I would like to share my recipe library. I will not be using this app going forward. This is easily the best way to store your various recipes from the web, your cookbooks, your grandmother. 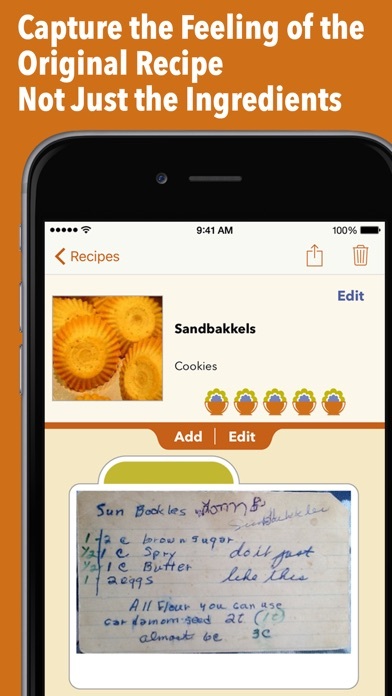 You can take pictures of recipes and easily load them in. Copy links to websites. Such an easy recipe collector!! I’m shocked at how poorly this app works—based on the other reviews I expected something much better. I can only assume they’ve paid for reviews. Uploading recipes from photos compresses the images to hell and back, so you can’t read them. Uploading a recipe “from a website” actually just screenshots the website, which, for some reason, doesn’t display properly. It, too, is rendered illegible. Uploading images or capturing websites is a tedious process—you have to upload each image or capture individually (there’s no group import function) and the app tries to crop each one, so you have to fix the crop on every image. Even if you surmount all this, the way the app DISPLAYS these images is awful. The view is cropped, and to see the whole image you have to click each thumbnail. You would be better off just storing all your recipes in a text file. Wish I hadn’t wasted my money. I wanted a means to store recipes. This app does exactly that. I can snap a picture from a book, magazine or note card. Bonuses include ability to “share” directly from websites and options to make specific categories. I do not need options to build grocery lists or modify recipe servings. This was exactly what I needed. 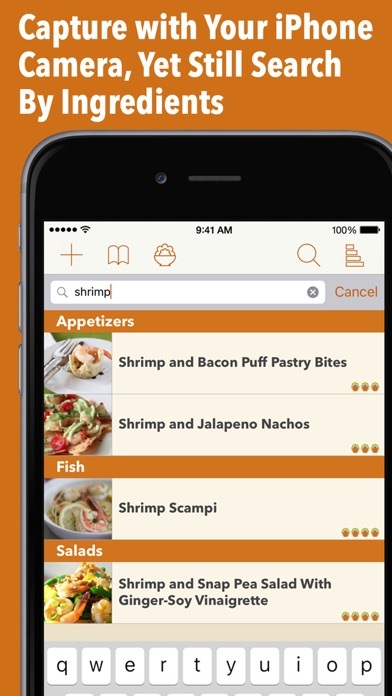 If multiple pages or pictures needed, the app senses it and offers suggestions. Even allows adjustment to screen saver time. Thank you for this.